Things to Consider Before Installing a Fire Pit | Done Right Landscape and Construction Company Inc.
Not only are fire pits a great addition for entertaining guests, they also make for an excellent backyard heat source in colder temperatures. With Thanksgiving coming up, what better way to keep warm as the turkey cooks than by snuggling up at your own fire pit? If you’re unsure where to begin, Done Right Landscape has a few things to consider! 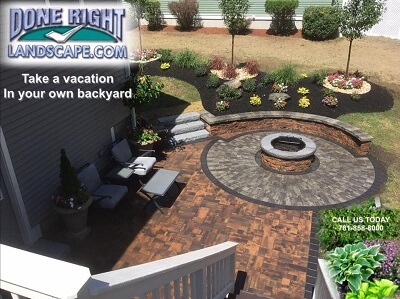 Are you looking for a permanent installation or a fire pit that you can move about your yard? Do you want a gas or wood burning pit? What type of material do you want it to be built out of? Depending on where you live, there may be fire pit regulations that you’ll need to look into. From zoning regulations to restrictions, you’ll want to check with the city or police department before you get started on your fire pit installation. When it comes to where you want your fire pit located, you don’t want to just place it anywhere. First things first, it should be at least ten feet from your home with a six-foot span so that your guests can gather safely around it. Take into consideration where the wind comes from so that people aren’t constantly being bothered by smoke. As you consider where to place your fire pit, be sure that it is placed on a neutral surface like gravel or brick. If you put it on a wood deck or lawn, you are at risk at starting a fire from any wandering embers. When it comes to choosing your type of wood to burn, go with cherry wood. Not only does it smell great, but it won’t spark easily like pine. If you have a gas fire pit, choose fire glass or lava rocks. Forgo using rocks you’ve found outside. Because they contain water, they’ll explode when heated. If you take these things into consideration before you install your fire pit, you’ll be able to enjoy it more! If you are interested in installing a fire pit for your Peabody or Reading home, contact Done Right Landscaping today! We are happy to discuss your project and provide you with a free quote. We can be reached by calling 781-858-8000 or by filling out our online contact form.